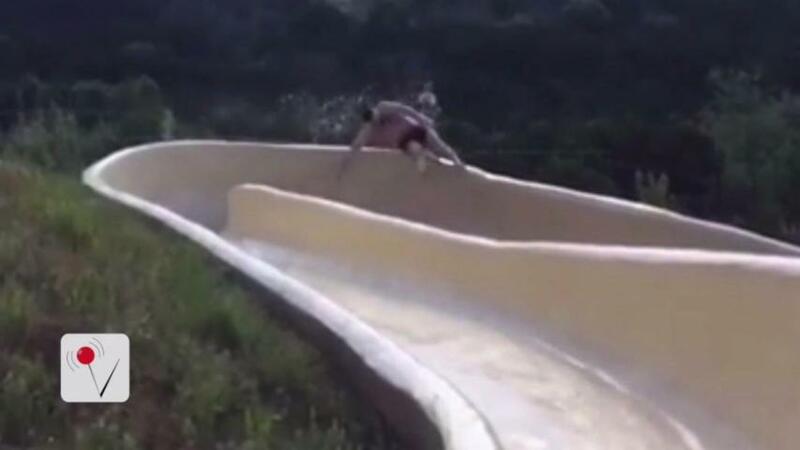 A man from Dallas, USA, nearly lost his life after slipping off a waterslide and over a rocky cliff. David Salmon was cruising down the slide on his back when he suddenly flew over the edge of the slide on a bend. He then fell 10 - 15 feet onto the rocky terrain below and as a result he was left with a broken arm, fractured ribs and lacerations covering his entire body. Salmon posted the video to Facebook on 18 July and has already had more than one million views. The video came with a comment from Salmon saying: "Too dang old to be going down waterslides. Fell off this one that is over a rocky cliff. First time in an ambulance." He also stated that he has to spend one more night in hospital before he will be allowed to head back home to Dallas. See also: Would you dare to ride the world's tallest waterslide? Comments on the video included one friend who said: "You gave us quite a scare. So glad you don't need surgery!!!" Another joked: "I guess the upside to this is you might be end up going viral!" According to a report on Fox4 the incident happened at a home overlooking Lake Travis, not at a water park. David spoke to Fox4 and said: "I'd gone down it a few times and it is fast but this time I just couldn't slow down, I even threw my arm out but went right over the edge." He added that after flying over the edge there was a hard crash and then the rest of the incident is blurry to him. Matt Mazure witnessed the moment and said: "I turned adn I could see him fly up and then he flew out." David was reportedly part of a large group of friends who had rented the house for the weekend. He admitted that the situation could have been far worse if he had broken his back or neck and added that the slide could have had higher sides or more protection.